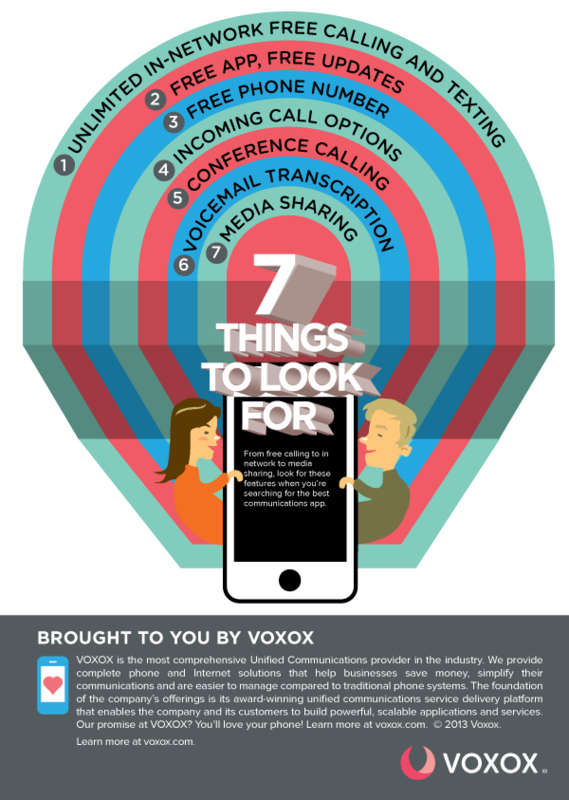 Here we present seven important and cool features you’ll want for your mobile VoIP communications. Free in-network phone calls and texts are standard service with most VoIP apps. Calls placed with the same provider are free. When you automatically import your contacts into Voxox, each contact with a Voxox account is flagged with a logo. The logo tells you at a glance that you can make free phone calls and texts to that contact. If you’re considering downloading a calling app that costs money, think again. Most mobile VoIP apps are available free. If you’re paying up front for the app, you may wind up paying for calling and texting. With so many great options available for free, why would you? Service updates should be downloadable at no cost as well. Getting a new phone number is part of the package. Or at least it should be. When you sign on to a new service you’ll get a free U.S. phone number that family and friends can use to call or text you. Some services, such as Voxox, even let you choose a number. If you’re a frequent international traveler, you already know the hurdles involved in trying to stay in touch with home. INums, or International Numbers, are free on many VoIP provider networks. Once set up, you can make free phone calls to numerous countries using a local access number. For more on international VoIP calling, refer to the Voxox blog post, TAKE YOUR PHONE ON A VACATION: THE BEST APPS FOR TRAVEL, Jul 24, 2014. A great VoIP app will give you many options for handling incoming calls. Thanks to the magic of caller ID, you have the choice of whether or not to answer an anonymous number. If you don’t want to miss a call, it can be forwarded to any number or numbers you choose. When you block a number using Voxox, it doesn’t appear on the screen at all, but the caller receives a “number out of service” message. Problem solved. It’s not just for business anymore. You want a VoIP app with free Conference Calling. A soccer coach can dial one team member, then simply add more members to the conversation — up to 20 people. Imagine saying, “Practice time has changed!” just once for everybody! Voicemail transcription gives you the same level of convenience and privacy as texting. Your VoIP app turns voice messages into text you can read without needing to log into voicemail. Voxox automatically transcribes voice messages so you can see at a glance if it’s something you need to respond to immediately. What’s a communications app without social media? Sharing experiences (i.e., making your friends jealous) is what relationships are all about. Make sure your VoIP app comes with location, image, video, audio, fax and contact sharing for maximum social living. When choosing an app for free phone calls, do your research, make comparisons and be picky. There are many apps to choose from. A rare few are worth considering. But don’t settle for anything less than everything.